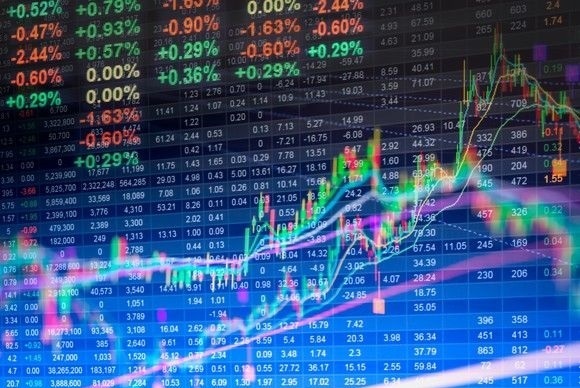 The sell-off at the end of 2018 surprised most everyone. The data coming in on earnings, unemployment and GDP growth all were records or surprises to the upside. Yet, stocks got cheaper. Perhaps the fear that something loomed ahead will, in fact, be proven incorrect as was the case in 2015 and into the first quarter of 2016 when oil plunged from $104 per barrel to a low of $33 per barrel. Markets seemed convinced we were headed for a worldwide recession. If you refer to our commentary around this time, you will see that we disagreed and pointed to the oversupply of oil and this would lift the consumer and help improve growth for developed economies. 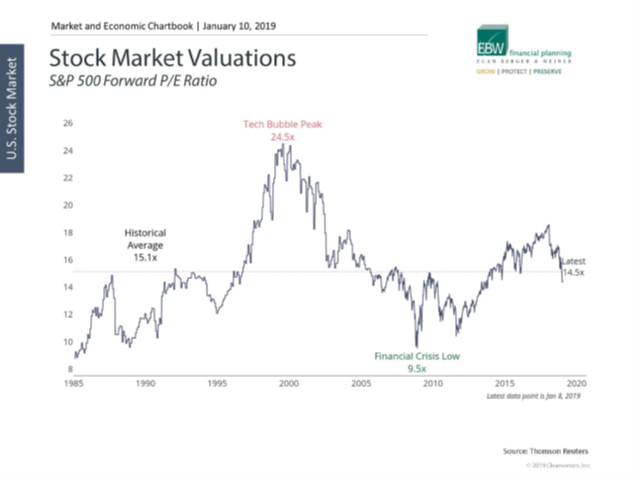 The price to earnings ratio of the U.S. stock market - as of January 8th - is at 14.5 times. This is below the 35-year average. If in fact there is no recession and the economy continues to grow as we anticipate, U.S. markets are very attractive at this level. 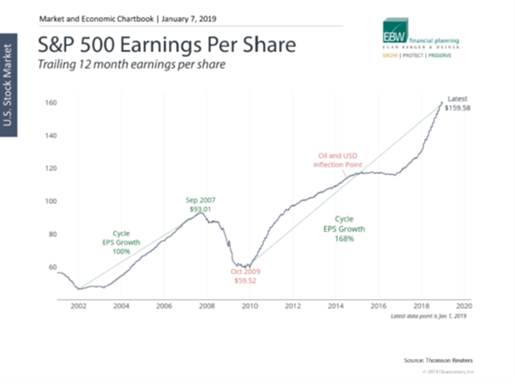 Earnings of the companies in the S&P 500 have reached record levels in this expansion. As a result of the tight labor market, companies have been making capital investments in the hopes of achieving productivity gains which can help them push off the impact of rising wages. However, they may take a small step back from recent highs as the 2018 tax cut boost wears off. They will most likely continue to grow again later in 2019. Continued trade negotiations loom and will affect the U.S GDP level, but the impact thus far has been minimal. The additional tariffs have been put off for the next 90 days while the United States and China try to negotiate an agreement. 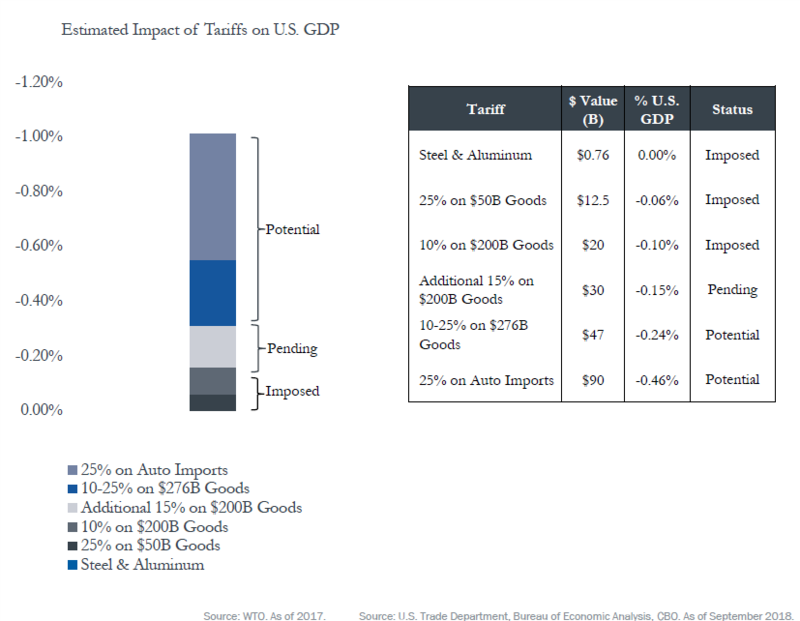 If the negotiations fail, then the impact of those additional tariffs could cost the U.S. one percent off the GDP forecast. This would be unfortunate, however, it should not risk tipping us into a recession, but pull GDP lower than 2%. The selloff in December appears to be pricing in no settlement in the trade negotiations. Should a deal be reached then I am sure there will be revisions to the upside on GDP growth and earnings expectations. Unemployment is at 50-year lows and there is a greater number of jobs available than individuals looking for work. This is in part due to a mismatch of skills of those unemployed and the jobs available (or a lack of willingness to take jobs for which one is overqualified). This labor shortage is boosting wages to levels not seen since 2006. 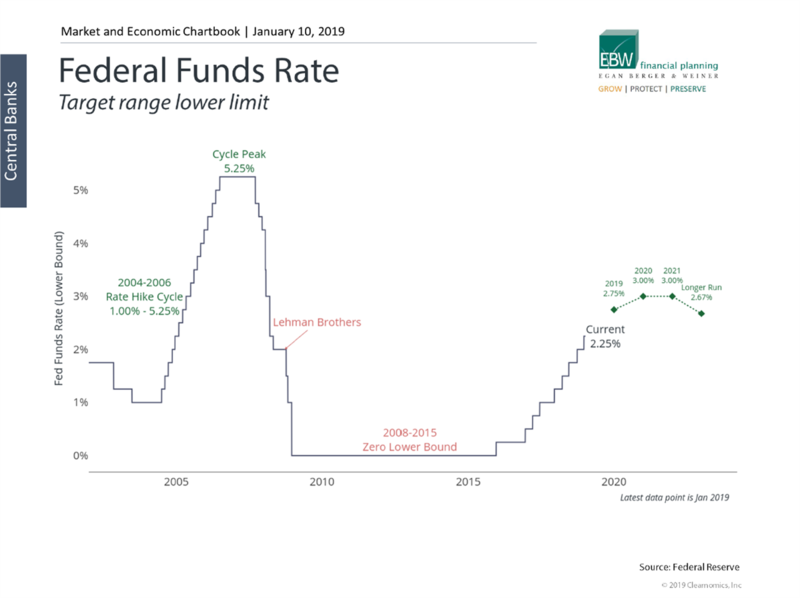 This is what has kept the Fed on course in 2018 with four rate hikes. Since the market sell-off, the Fed has softened their tone to say they will continue to raise but are willing to pause if the data changes. They see themselves raising rates beyond 2020 indicating they do not see a recession in their forecast for another two to three years. Obviously, this is subject to change with new data. At this point, we do not feel rates are rising too fast to impact the credit cycle. Rates will cause issues with the financing of government debt. See a brief discussion on this at the end. The residential housing market remains strong despite the rising rates. 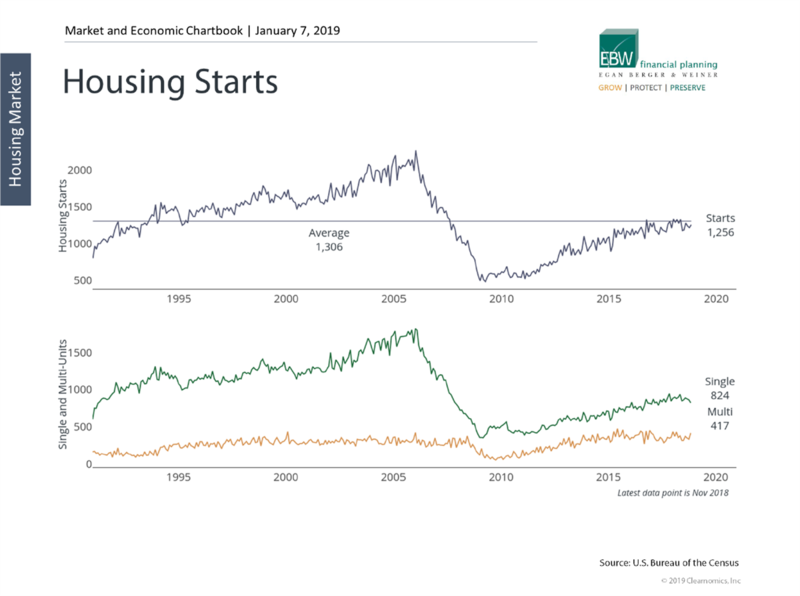 Housing starts are at the average level of the last 20 years. With increases in wages, we should see housing affordability remain strong. Mortgage rates are still historically low (around 4.5%) for a 30-year loan. 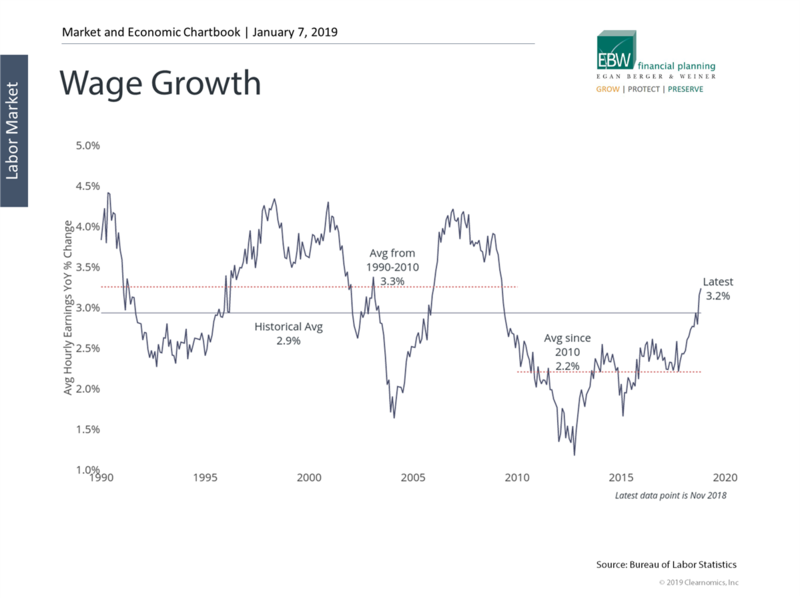 The average over the last 10 years has been 4.2%. 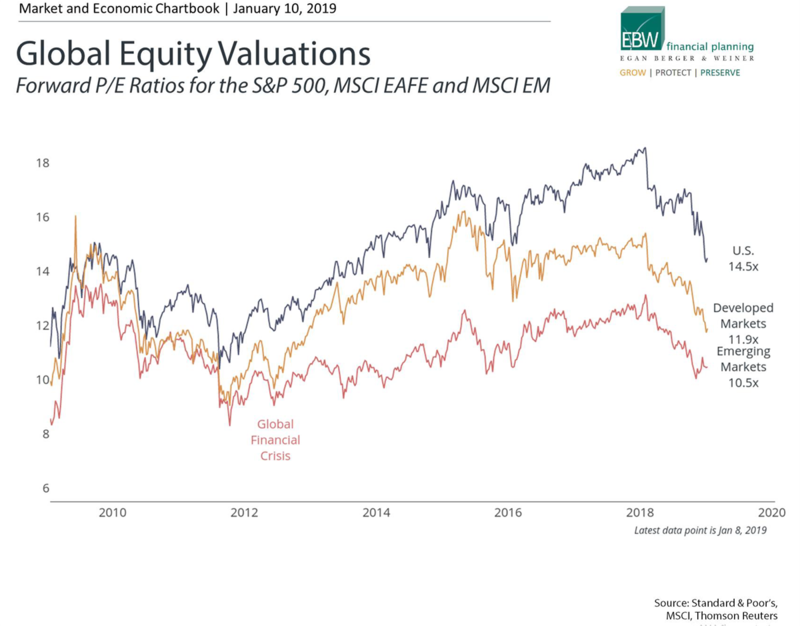 Markets around the world are all running on the lower value range. Political challenges in Europe remain high and Brexit is still not complete. They are still struggling to grow their economies. Select companies may be good investments, but regional investing in Europe remains problematic. We have resisted the urge in the last two years of increasing international despite its deep value. We will nibble at some point, but not now. Emerging markets (EM), however, offer compelling growth opportunities. They have more vulnerabilities to a strengthening US dollar, but we think the dollar may have strengthened too fast. A reversal in the dollar, along with higher commodity prices, will give the EM a growth boost. We may add exposure there sooner than in the developed world. Bull markets don’t die of old age. They are murdered by an event or series of events. They are normally snuffed out by high inflation, Fed tightening too aggressively, extreme asset valuations or a combination of these events. Currently, inflation is low and benign. The Fed is paced and transparent, even willing to slow if necessary, to keep the expansion in tack. Stocks are attractively priced as we discussed earlier. We see no concentrated risks such as the one of the housing market in 2006-7 or technology stocks in 1999-2000. The debt and the deficit will be a problem long term, especially as rates persist higher. 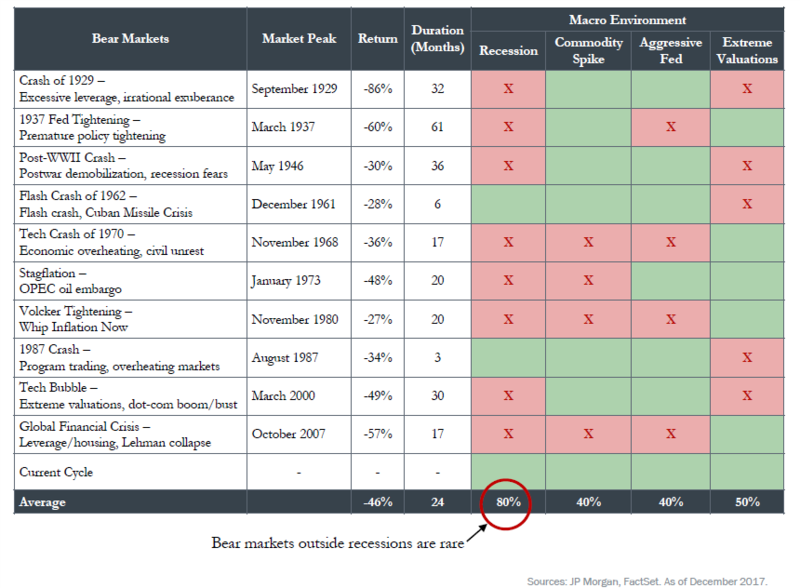 Markets can continue to discount these factors as they can be changed through legislation. There is little will to tackle the root cause of these issues. At some point, without significant entitlement reform and a reduction in the annual deficit, it will become a problem. The impact is too far off into the future and does not influence short term economics. Hopefully, we will not wait for a crisis to do something. The markets will at some point reflect this nearing crisis if left without any reform in the debt level as a share of GDP. Currently, the debt to GDP ratio is 105.25%. Persistent high levels of government debt are inflationary at some point, especially when strong demand outpaces supply. This happens with a sudden birth increase, such as the post-war baby boom in the 1950-60s. This was partially responsible for the inflationary problems of the 1970s. This type of forecasting as to timing is nearly impossible to perform. Why do I bring it up? I don’t want folks to think we don’t care, and it isn’t an issue. It is, however, its solutions are political and I don’t think I need to remind everyone how divided we are politically in 2019. We are fairly optimistic 2019 will be better than 2018 if we can get resolution on trade and the political environment can soften domestically and abroad. The content in the following article was prepared by the article’s author. Voya Financial Advisors, Inc. does not endorse its content, and the views expressed may not necessarily reflect those held by Voya Financial Advisors, Inc.
Past performance is not an indication or guarantee of future results.